Yoko Kanno’s soundtrack wasn’t just a soundtrack, it was an ethos: Try everything, stay loose, and keep it moving. As a project, Cowboy Bebop didn’t have an auspicious beginning. By the time Shinichiro Watanabe’s eclectic, free-wheeling anime debuted 20 years ago this week, it had already been put through the wringer. Canceled by the toys division of the Bandai corporation that had originally commissioned it, Bebop was plucked from oblivion at the last second by another branch of the conglomerate, and its shaky status didn’t cease with its premiere: Advertisers were so put off by its pharmaceutical- and violence-laden content that only 12 episodes of its 26-episode run aired as originally planned. If it wasn’t a failure, the specter of failure hovered over it constantly, not least because falling short was one of its story’s primary themes. 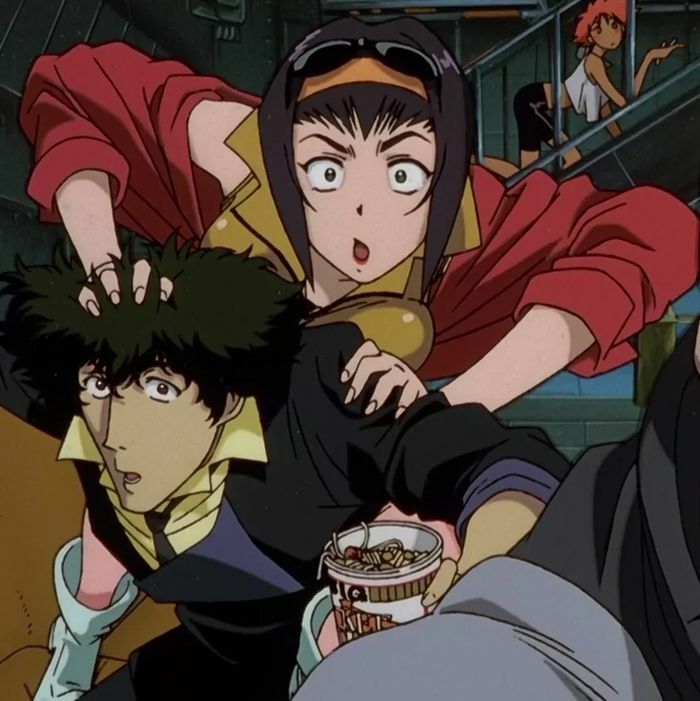 Set in a 21st century where a manmade cataclysm has forced most of humanity to abandon Earth for the other planets in the solar system, Bebop’s narrative centers around a quartet of bounty hunters joined together by chance and sucked into absurd, haphazard quests that only rarely yield enough to live on, let alone live well. The only thing that unites the protagonists — cool, haunted Spike; sturdy, dogged Jet; Faye, fickle gambler and amnesiac; Ed, child-hacker prodigy and general enthusiast — is poverty. They barely function as a team. Many, if not most, of their interactions consist of bickering; no one falls in love. Their mothership, the Bebop, is constantly short on fuel; likewise, their stomachs are in a constant state of grumbling. And the strangers they encounter are rarely less adrift; wherever they go, disorientation and unpredictability reign. The economy is in recession. The conjunction of randomness and want that defined the tone of show was accentuated by its soundtrack. Composed by Yoko Kanno and performed by a band, the Seatbelts, that Kanno had convened, the Bebop soundtrack made up, in planetary fashion, a dizzying array of genre reinventions (ranging from heavy metal to country, blues to torch songs, funk to French) orbiting a brilliant core of Kanno’s jazz compositions. Though nearly all episodes were heralded by the horn blasts of the opening theme “Tank!” and capped off by the rousing yet lounge-y and melancholic rock of “The Real Folk Blues” over the ending credits, each Bebop episode flaunted its musical range in a way far exceeding the basic standards of accompaniment. Kanno’s soundtrack wasn’t just a soundtrack, it was an ethos: Try everything, stay loose, and keep it moving. Theme songs aside, it was rare for a song to make an encore: When they did, they signified a fleeting mood instead of something so solid as a motif. (The only real exception is “Road to the West,” a yearning horn solo symbolizing damage in flight, but since it only plays in the first and second-to-last episodes, even that connection is easy to miss.) Mostly, songs from the soundtrack — which, including remixes, added up to something like ten discs plus a boxed set — would make a splash once and never recur again. One would have to enjoy the songs of Bebop in the moment or not at all. Improvisation is the soul of jazz, and both Watanabe and Kanno were intent on fusing the agile, aleatory spirit of plot and characters with a parallel musical sensibility until the two could no longer be told apart. Visually, the show was an astonishing feat of invention premised on unlimited cultural exchange. Bebop’s visuals owed little, if anything, to the prevailing trends in anime during the ’90s: though Watanabe had built a reputation as a co-director in major mecha (a.k.a. giant robot) franchises such as Gundam and Macross, his vision of the future owed far more to a love of Bruce Lee’s kung-fu, John Woo’s gun-fu, and vital subgenres of American cinema, especially film noir. Bebop’s unique blend of bleakness and pizzazz would soon make it a hit with viewers, critics, and tastemakers alike on both sides of the North Pacific. By now, you could even argue that it’s better loved in the United States than in Japan. (It is soon getting a live-action U.S. adaptation from the original studio.) American audiences were particularly eager to embrace an anime whose cultural touchstones, for the first time, were largely their own. If Bebop isn’t the best anime ever, it’s surely the easiest to make the case to grown-ups raised in the West. Bebop’s influence within the world of anime has been limited: Few directors, aside from Watanabe himself (check his samurai-slash-B-boy series Samurai Champloo), have continued its legacy of cultural cross-breeding and its pursuit of narrative indirection. In one sense, the times are not on Bebop’s side. The long odds it barely overcame to emerge into the world are even more impossible now: the Japanese economy, slowly and steadily waning in the new millennium, is hardly one where firms are willing to finance an ambitious animation experiment conducted purely through style. Yet it’s precisely such shifts in the economy that have made Bebop seem more relevant than ever — prophetic, even — in 2018. What are Spike, Jet, Faye, and Ed, after all, if not freelancers barely making ends meet in the midst of a prolonged recession? So long as the brilliant liberty of remixing culture (even if it takes place mostly, today, at the level of memes) takes place within a general context of dire socioeconomic straits, Bebop, like the jazz that inspired it, can never truly fall out of style. And even if one doesn’t expect them to remain current for the decades to come, Watanabe’s description of their shared aesthetic process — “the work, which becomes a new genre itself” — is something any artist would be fortunate to strive for, much less achieve.